Better Built Barns - Create Your Custom Shed Or Garage Today! We build quality sheds, studios, cabins, and garages. Whatever you need, we have the perfect outbuilding to suit your property. Looking for a shed builder you can trust? Look no further! We're committed to the craft of shed building and serving our customers with honesty, quality, and value. For the most basic to the most complex, we have you covered. We've been in the business for more than 20 years and have the expertise it takes to be the best. We have locations in three states! Our sheds, garages, and cabins start as very basic structures meant for customization and design by our customers. We offer a wide variety of options and accessories to tailor the building to fit your exact needs. Payments As Low As $60 Per Month on a $5,000 Purchase. Less than you'll pay for a rental unit! We have so much confidence in the quality of our structures that we guarantee them for 10 YEARS! 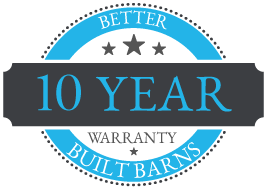 Call Better Built Barns today for more information on our 10-year warranty.